After more than 12 years of experience with pulse induction metal detectors, DeepTech are glad to introduce you the new Megapulse SR 126, designed for the treasure hunter that does not want to bother with too many controls. 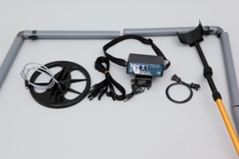 Megapulse SR 126 is designed for detecting deeply buried or lost metal objects, metal pipes, unterground communication equipment, treasures and similar objects and can easily detect larger objects, buried at great depth. It is because this unit works by the principle of electromagnetic induction at a very low frequency, which allows penetration deeply in the ground. -	Three package options to choose from.